This post is focused on some things a I go through as start-up co-founder on regular basis. Some points to expect if you want to walk this thorny path. You got to believe in it, or fake it every day every moment. People believe in you, keep their hopes and hard-work alive. I fear of success, because its short-term loss. Failure is ongoing lesson and helps boost my morale and product. Unfortunately, there is no “I Quit” in this role. Stress is natural because I get good and bad news simultaneously. Eventually, I have learnt to celebrate none. Choose a physical activity as a hobby, have a spa once a month. Now I know why that super senior guy in my last job in his 60’s never missed his gym workout. Sometimes you have to say yes when you want to say no. You are not ALWAYS allowed to take risks the way you want. Every time, I just hope that sharing and taking a collective decision with other co-founders only helps in better decisions. At home, my wife has to shake me and tell me you are watching TV and not thinking of that design improvement. All home responsibilities seem so small that you want to delegate them. For truly enjoying family life, you need to do small things yourself. Money is always a by-product, which comes only if you are lucky. I keep pushing and creating value right from seed to start to growth to more growth-stages. That SUV can wait another year is all I can tell myself. My first vacation after starting uTrade happened after 3 long years. Team is what defines the products/company. Priorities and expectations of people change. At times, we think will always remain the same. Keep talking, helps understand yourself and team members and company’s benefits. Clients (especially Indian clients) only complain on problems and do not complement on achievements. So far, I have met only one client who called me in the evening and said “Sir you and your team has done wonders. Thankyou”. If you are missing your meals or having them at wrong time un-intentionally, it only means you are on a mission. Relish it. Cherish it. There is more important things than timely meals food. 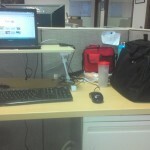 Realizing I have to be on my toes all the time, I have opted for a standing desk. Helps me move quickly and reminds me I am here for my team and product.